The weekly protest at the Gaza beach to protest the ongoing Israeli closure of sea access to Gaza was met with violence from Israeli forces today, who fired live ammunition at protesters in boats and along the shore. 25 were wounded with live bullets, including an AP camera operator. 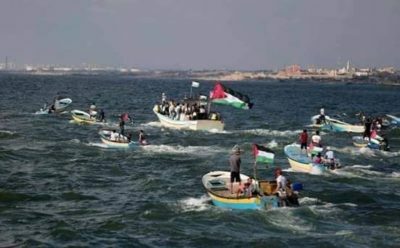 The protest took place off the coast of Beit Lahia, in northern Gaza, when hundreds of Palestinians gathered on the shore and then took off in small fishing boats bearing Palestinian flags into the Mediterranean Sea. Almost immediately, the Israeli Naval ships stationed off the coast began firing live ammunition toward the protesters, according to local sources. The Israeli Navy also fired tear gas canisters, causing passengers on the boats to suffer from tear gas inhalation. One of the people wounded by the Israeli forces’ live ammunition was a camera operator working for the Associated Press (AP), who was shot in the foot. In a separate protest Monday along the Gaza-Israel border, a 13-year old boy was reportedly injured by live ammunition fired by Israeli forces, according to local sources. As part of Israel’s blockade of the coastal enclave since 2007, the Israeli army, citing security concerns, requires Palestinian fishermen in the Gaza Strip to work within a limited “designated fishing zone,” the exact limits of which are decided by Israeli authorities and have historically fluctuated. Many attempts have been made, throughout the years, to draw the public’s attention to and break the on-going siege of the Gaza Strip, whether via ships attempting to sail into Gaza, or ships attempting to sail from Gaza. The maritime protest has continued each Monday despite an announcement on November 3rd that Qatar and Israel had agreed to establish a sea passage between Cyprus and the Gaza Strip. At that time, the Lebanese newspaper Al-Akhbar reported that the route would be monitored by international forces and under Israeli security supervision – including cameras, computer networking and the presence of international inspectors. But a few days after the agreement was announced, Israeli forces violated the ceasefire with an operation in Gaza in which they killed several Palestinians and one of their soldiers was also killed. That was followed by a series of Israeli airstrikes and Palestinian resistance fighters’ rocket attacks – leading to the breakdown of the ceasefire agreement. The plan for a maritime passage remains uncertain at this time, and the popular resistance in Gaza has vowed to continue its weekly non-violent challenge to the Israeli naval siege, despite being met each time with live ammunition from the Israeli naval forces.